English philosopher and scholar of the thirteenth century; born at Ilchester, England, about 1214; died about 1294. He studied at Oxford and spent some years in Paris, where he obtained the degree of doctor of theology. In 1250 he was again at Oxford, and about this time became a Franciscan friar. He devoted himself to a mastery of all human knowledge—theological, philosophical, philological, and physical. His fame spread very rapidly, and he acquired the title of "doctor mirabilis" among those of his contemporaries who recognized his wide and profound erudition; while his physical and chemical apparatus and experiments secured for him the reputation of dealing in magic and the black arts, and aroused suspicions as to his orthodoxy. Bonaventura, general of the order, about 1257, interdicted his lectures at Oxford, and commanded him to place himself under the supervision of the body in Paris; and there he remained for ten years under strict surveillance. In the year 1265 Cardinal Guy de Foulques became pope under the name of Clement IV. Shortly before, he had been sent by Pope Urban IV. to England to intervene in the disputes between Henry III. and his barons, and had then made the acquaintance of Bacon. The new pope, in 1266, directed Bacon to send him in manuscript the results of his researches, despite the interdictions of Bacon's superiors. This papal authorization gave an impetus to Bacon's pen; and in about eighteen months he completed the three great treatises, "Opus Majus," "Opus Minus," and "Opus Tertium." The result of the receipt of these works by the pope was that in 1268 Bacon was permitted to return to Oxford, where he continued his studies and the composition of learned treatises. In 1278, however, the general of the order condemned Bacon's writings; and he was thrown into prison, there to remain for fourteen years. One of the most remarkable of Bacon's many great achievements in the sphere of learning is his demonstration of the need for prosecuting the study of the Hebrew language—a study which was as unknown in England as on the Continent till the fifteenth century, when Reuchlin aroused the mind of Europe on the subject. 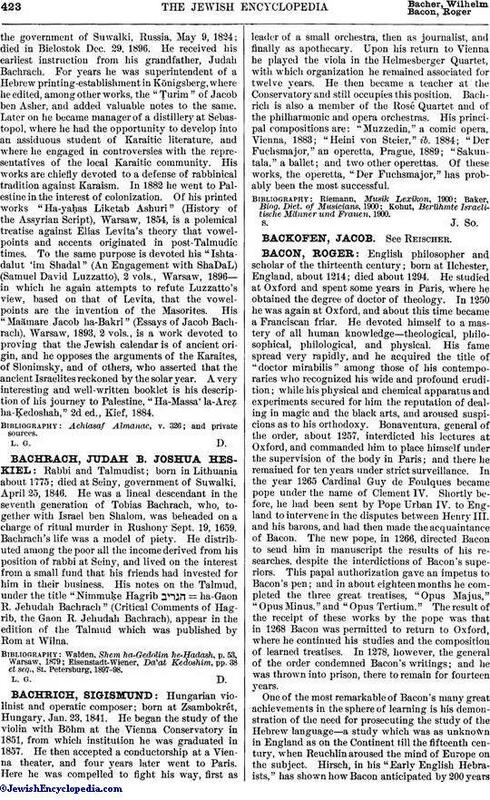 Hirsch, in his "Early English Hebraists," has shown how Bacon anticipated by 200 yearsalmost all of the reasons advanced by Reuchlin for spreading a knowledge of the Hebrew tongue; viz., religious motives, Hebrew being the language in which God first revealed His will to mankind; the difficulty of translating accurately from one language to another, and the danger of perpetuating errors once committed in translation. Furthermore, he was animated by the true philological spirit, and sought to develop the comparative study of languages generally. 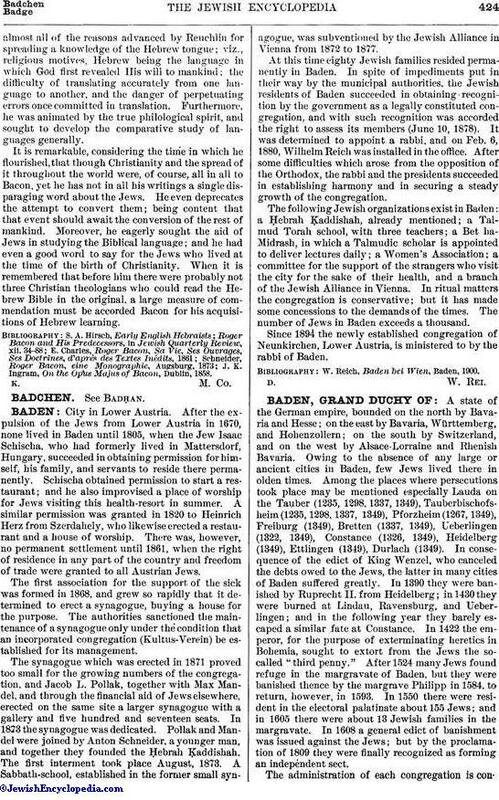 It is remarkable, considering the time in which he flourished, that though Christianity and the spread of it throughout the world were, of course, all in all to Bacon, yet he has not in all his writings a single disparaging word about the Jews. He even deprecates the attempt to convert them; being content that that event should await the conversion of the rest of mankind. Moreover, he eagerly sought the aid of Jews in studying the Biblical language; and he had even a good word to say for the Jews who lived at the time of the birth of Christianity. When it is remembered that before him there were probably not three Christian theologians who could read the Hebrew Bible in the original, a large measure of commendation must be accorded Bacon for his acquisitions of Hebrew learning. J. K. Ingram, On the Opus Majus of Bacon, Dublin, 1858.